19th century pen and ink drawing of church within a churchyard in gilt frame. 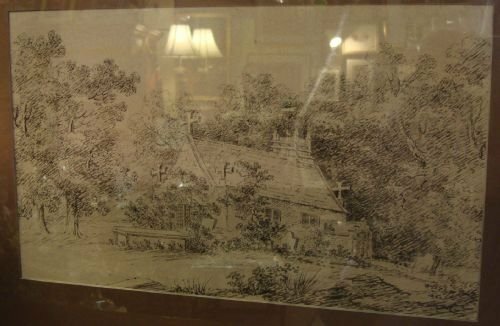 19th century very good pen and ink drawing of a church within a churchyard, newly professionally conservation mounted and framed within a gilt frame and protected by glass. Size 23.25 inches wide by 16.25 inches high. 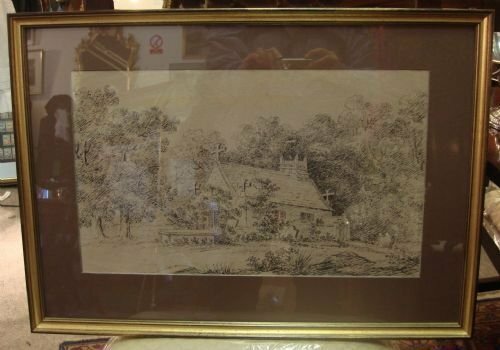 A lovely and skilled example of a 19th century drawing. 20thC original oil painting in gilt frame, signed by MARGOT HARRISON, of a scene in Hartley Wintney, Hants. 20th century original oil painting on board signed and in gilt frame, by Margot Harrison, painted in Hartley Wintney, Hants, entitled "By the River," at Elvetham Old Rectory, in Hartley Wintney, Hants. A lovely evocative scene in the original gilt frame. Very well executed. Size-15.75 inches wide by 11.25 inches high. Painter born in Madras, India. She studied privately with Edwin Pascoe Holman and was for four years a part-time student at Farnham Art School with John Wilkinson. A member of SWA and RWS , she also exhibited at ROI, RBA and in provincial galleries and had several solo shows in London. A lovely painting, in a Hampshire setting, in very good condition. 20thC original botanical watercolour painting, signed, dated and framed. Lovely 20th century original botanical watercolour painting mounted in gilt frame, labeled "Hemerocallis fulva-Day-Lily. Ox-eye Daisy," and signed G. B. '71. From a large country home in Sussex, this was painted in the early 1970's by Grace Bedford, a talented watercolour artist, whose main interest was in botany. It is very well executed and very realistic, with skillful use of shadowing technique as well. It would make a lovely decorative statement for any room. This is one of 12 to be listed, with only a few remaining, and can be hung in groupings if desired. Size-15.25 inches by 17.75 inches. A stunning piece in very good condition. Lovely 20th century original botanical watercolour painting mounted in gilt frame, labeled "Kalmia Latifolia," and signed G. B. '72. Size-16 inches by 18.5 inches. 20thC original botanical watercolour painting in gilt frame. Lovely 20th century original botanical watercolour painting mounted in gilt frame. Size-17.25 inches by 20.5 inches. 19thC original oil portrait in gilt frame, possibly Dutch. 19th century skilfully painted possibly Dutch oil painting portrait on board, sympathetically framed and newly mounted in a carved gilt wood frame. 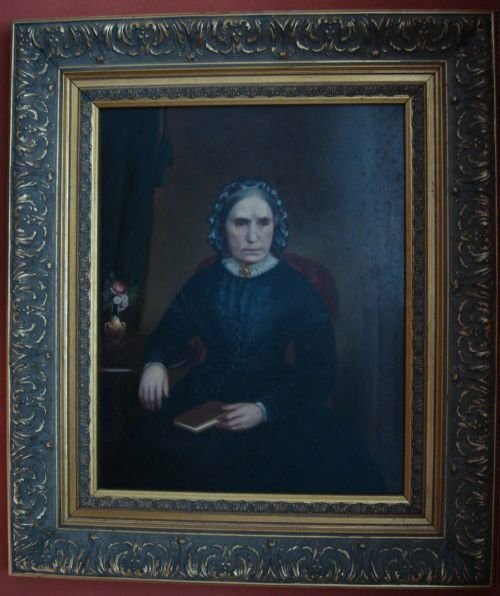 The painting features an older woman seated in her sitting room.The details of her face and hands are so realistic, as are even the velvet drapes hanging to the left behind her, her lace cap, gold brooch and simple gold wedding band. Very well painted and in very good condition. Size-18.5 inches wide by 21.5 inches high by 2 inches deep overall inclusive of the frame. Visible size of painting inside frame-11 3/8 inches by 14 3/8 inches. Please ask for shipping quote to your location. Dated 1826, Georgian period very charming and thought provoking needlework sampler by Deliah How. "When this you see remember me and hear me in your mind. Let all the world say what they will. Speak of me as you find." What a thought provoking verse, reaching out to the viewer from 183 years ago. A very charming sampler, mounted in later burr frame and glazed. 15.5 inches wide by 19.5 inches high. 19th century silk hand painted fan mounted in bespoke gilt wood frame. 19th century large and lovely silk hand painted hand fan mounted in bespoke gilt wood and glazed frame with moulded edge. The painted design is comprised of flowers and a butterfly. The guardsticks and sticks are wood with ornate gilt designs, and the fan has the original tassel. The frame is a classic design, with moulded edge, and echoes the shape of the fan beautifully. Size-28.5 inches long by 17 inches high by 2 inches deep. A very decorative accessory which will blend with any decor, or a pretty piece for the fan collector. 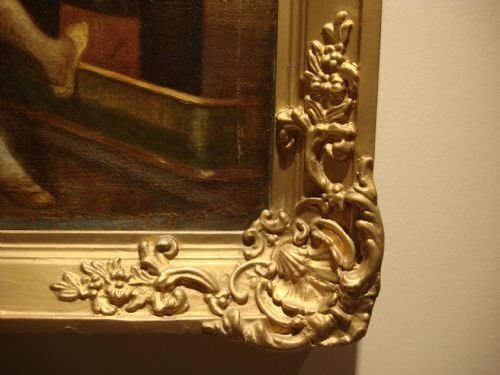 19thC oil portrait of a young girl in original gilt frame. 19th century oil painting on canvas portrait of a young beautiful girl in original oval gilt frame. 13 inches wide by 15 inches deep. 19th century oil painting modelled on the poet William Cowper, with eccentric subject, mounted in lovely old ornate gilt frame. 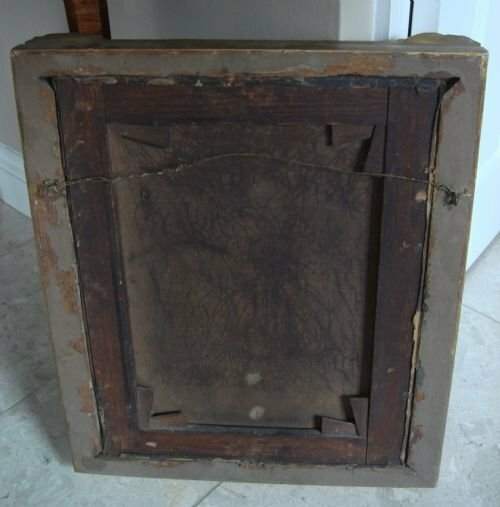 19th century unusual oil on canvas painting, mounted in very nice ornate gilt wood frame. The painting does not appear to be signed, and the artist is unknown. 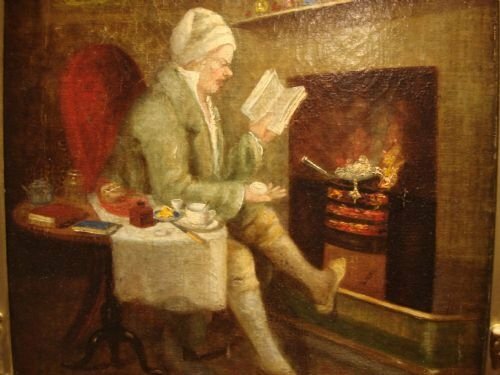 The subject is an absent minded or eccentric man in night clothes intending to boil an egg over the fire, and time it with his watch, while passing the time reading, but actually boils his watch, and times it with the egg he holds in his hand! The subject is reportedly William Cowper (1731-1800) the poet, and the artist is unknown. William Cowper was one of the most popular 18th century English poets, who changed the direction of poetry in that era, by writing about everyday life and scenes of the countryside. He was also a severe manic depressive, and spent time in asylums. This may be after a painting by Theodore Lane entitled Mathematical Abstraction, of the same theme. He painted themes of domestic whimsy and eccentricity. His paintings are on exhibit at the Tate Gallery. 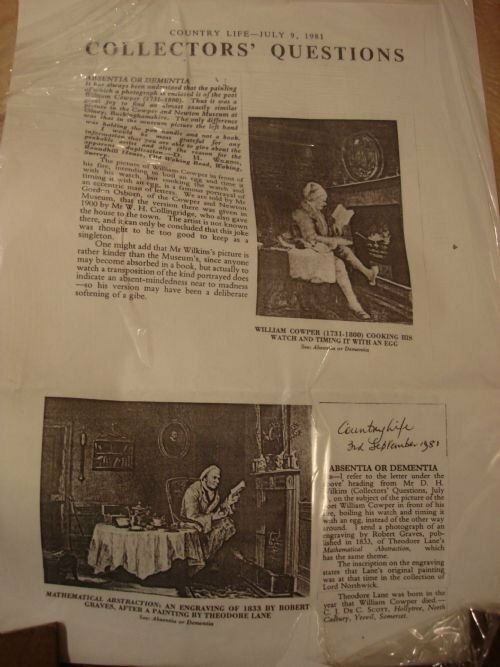 Supporting collectors magazine articles are attached to the back of the painting. Other points of interest in this painting are the displays of collectable objects in still life form on the table and mantel, as well as the very detailed cooking fire showing the watch chain with at least three jewelled seals dangling from the pot. Size overall-18 inches wide by 21 inches high by 2.25 inches deep. Size of canvas only-14 1/8 inches wide by 18 1/8 inches high. 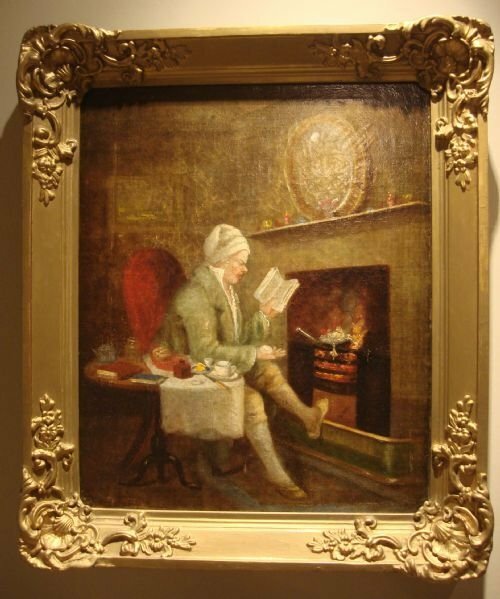 A very nice and quirky oil painting, which would look lovely in any room, and might be particularly appealing or appropriate for antique collectors.